Bands are being heard, brands are being seen! Chordify is an online music service that transforms music into chords. 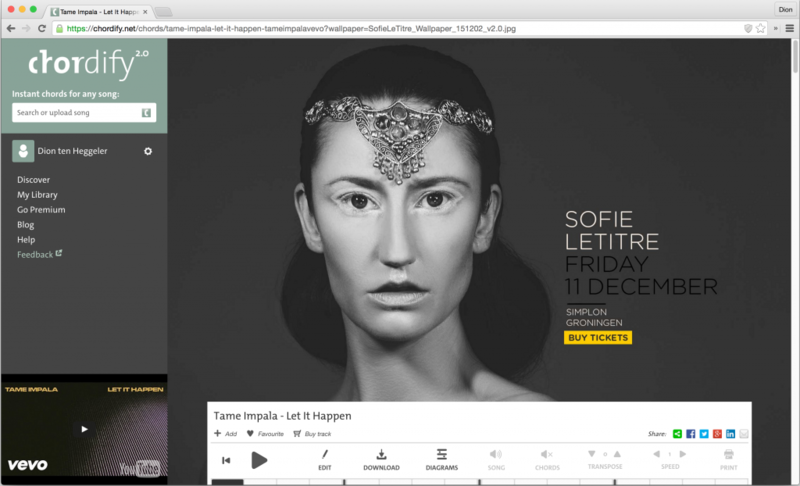 The basic Chordify functionality can be used without additional costs because the site is designed to be supported by full screen advertisements. While conventional advertising methods are often experienced as intrusive, our website content and advertisements complement each other and add value. It’s a win-win situation that has proven to result in a high click-through rate! Do you want to reach a large and carefully targeted audience? Chordify invites commercial parties to advertise with us. Together with the best global brands we create astonishing, targeted campaigns and site takeovers with a focus on music, culture, tech, art and design. Advertising on Chordify is all about billboards, leaderboards and wallpaper advertisements (CPM). We can also advise on advertisements and bring you into contact with professional designers. Chordify loves music and musicians. Our wallpaper space, besides its use for commercial messages, is also available for promoting bands and music we endorse. No strings attached, we promise! Do you have a brand new album to promote, are you organising an awesome festival, or do you have anything else that needs to be seen by thousands of music enthusiasts every day? Contact us right away! Non-commercial parties can advertise with us free of charge.